I ordered dry polenta on Amazon and when I got home the other day there were 3 boxes of polenta waiting for me. 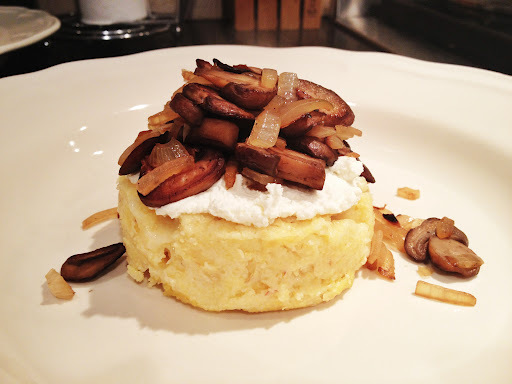 Remembering a dish we had while out with some friends not long ago I whipped up this easy but Oh So Delicious recipe. This dish would ideally be served as an appetizer, but we ate double and triple portions of it for dinner. Directions: Preheat your oven to 350 degrees. Cook the polenta according to package directions (if you cook the entire package like I did you’ll end up with far more polenta than you need…no worries, leftover polenta can be cut into cubes and refrigerated). Instead of using 6 cups of water I did 4 cups water and 2 cups milk. Season the polenta with salt and pepper to taste. 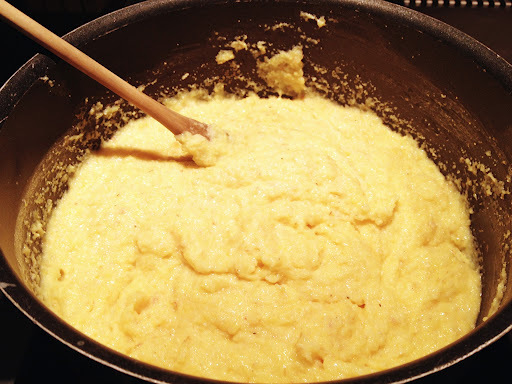 Once the polenta is fully cooked, mix in the grated Gruyere cheese. Spray a baking dish with cooking spray and transfer the polenta into the baking dish. 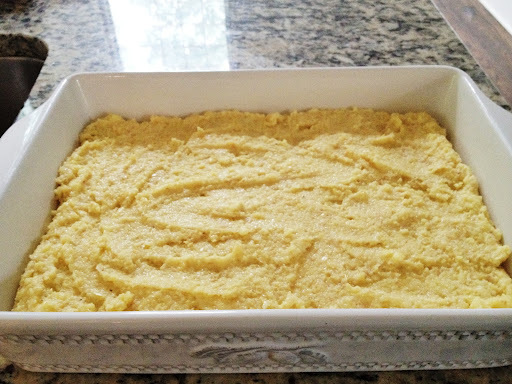 Bake the polenta, uncovered, for about 10 minutes. Remove and set aside. Meanwhile, saute your mushrooms in a pan until they shrink significantly. Adding some salt to them will speed up the process. Leave the pan open to allow the moisture to evaporate. Add the chopped onions to the pan. Stir the mushrooms and onions to keep them from burning and allow the onions to caramelize a bit. In another saucepan, bring your tomato sauce to a boil. Add in fresh basil leaves (nothing enhances the taste of tomato sauce like some fresh basil leaves). While the mushrooms and sauce are heating up crush the garlic into the goat cheese and mix until the cheese has an easily spreadable consistency. I used a glass to cut out circles in the polenta but you can always bake the polenta in a cupcake pan if you like that size and shape. 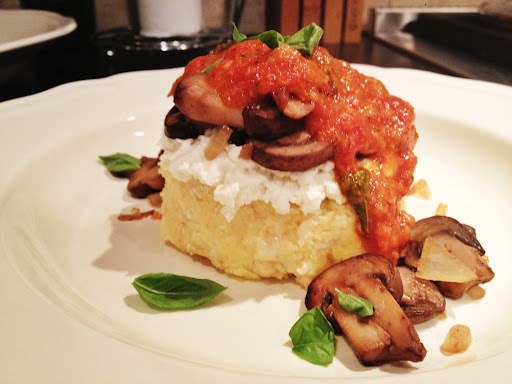 Place the polenta cutout on the dish and spread a generous layer of the garlic goat cheese over it. Then spoon some of the mushroom and onion mixture over the goat cheese. Top the mushrooms and onions with some of your hot tomato sauce and once again, add some fresh basil leaves to give your dish that refreshing and colorful appeal. This entry was posted on September 6, 2012 by natalyaperullo in Food.